Since 2016 the UK based NKT label has been the outlet for a small clutch of cassette releases from the aligned project Nokuit, where I personally became aware of both label and project via a 2017 release (reviewed here). 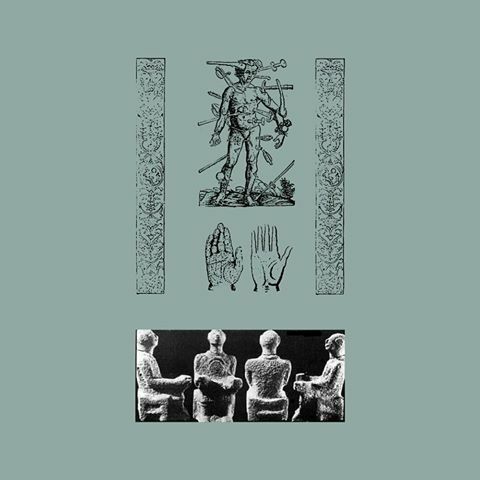 Now the label has branched out to issue a new project Presidiomodelo which is a Siberian ritual ambient trio where the title of the tape Внутренняя Империя is then noted to translate to “Inner Empire”. Being ancient and archaic in expression and execution, the single composition spans around 31 minutes of music in total, which is split across the two sides of the tape. Covering a wide variety of interlinked sonic moods and themes, the patter of rain provides a naturalistic setting from the outset, before droning mid-toned synths sweep into sonic frame, undercut with low key metallic scraping textures and other field recording elements, before settling down into a muted looped industrial rumble. Soon enough things evolve again with deep percussive thuds, ritual signing bowls, metallic chimes and atonal wailing of woodwind instruments, while heavily echoed treated vocals evoke a choir like effect and offset with more naturalistic elements grounds the mood in an earthbound perspective. While the mid-section it is categorized by animated and forceful cyclic drones, just a quickly the tone shifts off into varied segments of: fast paced ritual percussion; minimalist ritual chimes; sparse woodwind instrumentation; widescreen droning synths; churning bass toned thrum; while the pattering rain returns at the very end to close the loop. On more than a few occasions I was reminded of the obscure French project Chöd and given the ritual ambient context of this release it is perhaps inevitable that a comparison to the Aural Hypnox Collective could also be made. Yet these comparisons should be read as a mark of quality, as this in no way feels to be copyist or derivative, given its own distinct compositional approach, and with at times a more muted industrial churn. Fold out multi-panel J-card with suitable archaic and ritualistic imagery rounds out the physical presentation, with a digital download also provided for good measure. This entry was posted in 2018, dark ambient, drone, experimental, NKT, other, ritual by noisereceptor. Bookmark the permalink.